Thousands of people have bought drones in Britain in the last few years, and when you see some of the results it’s easy to understand why. Drones or Unmanned Aerial Vehicles (UAVs) can be a perfect inexpensive way for adding some stunning jaw-dropping high angle shots to your films. However, it can be a bit of a minefield finding the right kit, putting the right team together and maximizing the footage captured on your shoot. To help you get your next drone project get off the ground (no pun intended) let’s take a look at the do’s and don’ts when it comes to shooting with drones. What type of drone should you shoot on? Although there are dozens of cheap drones with built-in cameras on the market that could potentially do a good job, having the right equipment is an absolute must if you’re looking to create those ‘wow’ shots you’re most likely after. The first thing to consider is the type of camera you want to use, which will determine the size of the drone and its payload – if you’re filming with a Go Pro then you may not require a big drone, however, anything larger and more expensive will require something that can give you piece of mind. For most of our shoots, we like to use the DJI S900 and Inspire models, that have a maximum take-off weight of 8.2kg and are suitable for most cameras and gimbals. Without a doubt drones are allowing filmmakers to create the types of films only previously available on 6 figure budgets, but to get the most from your shoot we’ve put together some of our top tips. Viewers are very used to wide landscape shots, that once upon a time used to wow audiences but now seem well, boring. Instead, perhaps consider your end frame first, then think what’s the most interesting way you can use your drone to transition there. The video below gives a fantastic example of perspective, scale and importantly has a carefully considered end frame. This is an awesome way to capture stunning action shots and make it feel like you’re truly experiencing what your subjects are. Try experimenting with different altitudes to get the desired effect you’re after. Ground level shots tend to be far more personal, whereas the higher altitude shots give context. This is essential when you’re trying to convey scale. Think about including visual aids for your viewers such as building, boats, trees, people, anything really that gives your viewers something they’re brains can relate to. Perhaps one of the most important considerations when flying with a drone. It sounds obvious, but unlike filming in a studio your primary light source will be the sun. Early morning and late evening can provide those magical shots and waiting for the right weather can have a huge impact on the finished shot. Flying towards the sun will act as a foot light and away will provide a back light. Also with the right cloud cover you will have your own natural light-box. By combining drone and gimbal movements you really can add another dimension to your shots. Try flying forward while tilting the camera to keep the viewers focus on one object, albeit seen from an ever changing angle. The video below by cinema5D provides a summary of the advice above along with some fantastic examples. Before you buy and fly, make sure you look at the Civil Aviation Authority’s ‘Dronecode’. The rules around drones in the UK are quite complex and the restrictions make filming in a city very difficult to achieve. If you’re using a drone for work purposes – in other words, you’re getting paid – then you’ll need permission from the CAA before you start. And there are other rules as well. Don’t let the drone out of sight, which means it has to be within 500 metres of the operator, and no more than 400ft from the ground. Congested areas are a no-no – in fact the CAA rules say that drones cannot be flown within 50 metres of any person, nor within 50 metres of ‘vessels, vehicles or structures’ which are not under your control. You can go on a CAA course to learn how to fly a drone responsibly. One other legal issue to consider is privacy – taking pictures of someone or filming them in their back garden where they have a reasonable expectation of privacy may land you in trouble. There are also laws about filming around courts, and military installations, so check your area before you fly. With complex rules around making films with drones, it pays to learn your craft thoroughly. Some of the best YouTube drone footage has been tagged on YouTube by the CAA and there have even been prosecutions. But fortunately UK regulations are less restrictive than some other countries and there are still a great many things to be done. The opportunity to add an extra dimension to a video or film has to be taken seriously by professionals and even though the best drones are not cheap, they are no more expensive than a decent laptop. 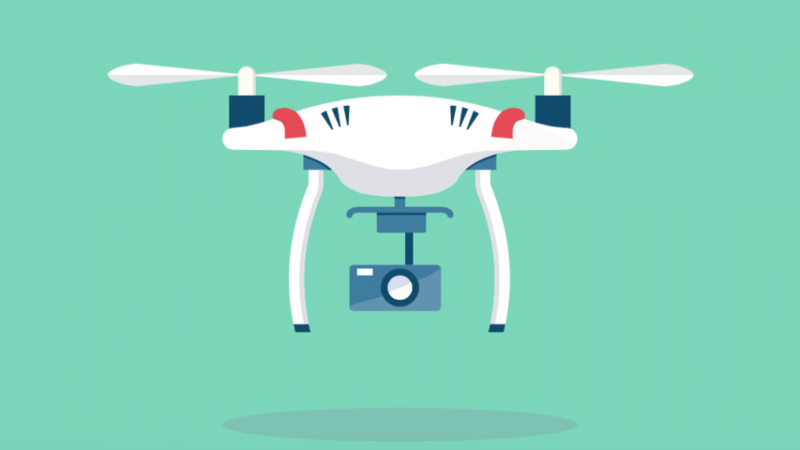 There’s a reason why drones are still one of the hottest things to hit video makers in the last decade – so what are you waiting for?